Hello! The weekend is here! I am looking forward to having some fun family time. We have so much planned and a bonus is school will be out for our high schooler in just a few short days. I have been loving using stamps from Amuse Studio. The designs are so fun. I am using the Tropical Blooms set from the June Collection. I used the masking technique to create my layout. I embossed all the images with gold embossing powder then I watercolored everything using Tombow dual brush markers on watercolor paper. 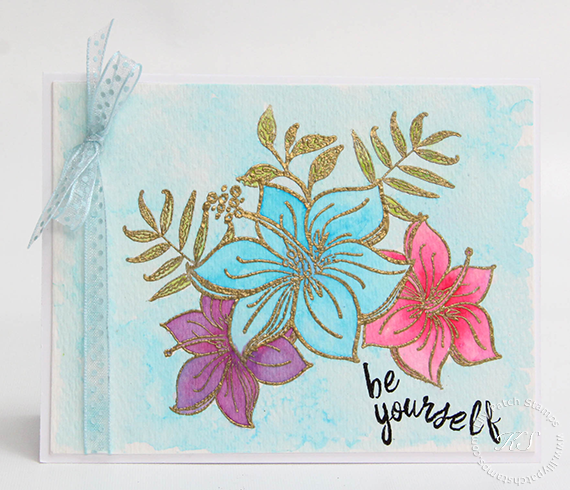 The sentiment is from the new Be Yourself set which is also available with the June Collection. I then added the polka dot ribbon. Have an awesome weekend! All supplies can be found here. Love this Kim - your arrangement is wonderful and I think it's great how you mixed the two sets! Such lovely, soft colours and a beautiful composition, Kim! That gold embossing adds a touch of something special too that lovely water-colouring too. So glad that you could join us for our 200th Challenge at CASology this week! Beautiful card! Love the gold embossing. Thanks for playing along with us at CASology this week! Gorgeous card Kim! It's so pretty and feminine, & the gold embossing looks wonderful. Many congratulations ! You have won our challenge over at Simon Says Stamp Wednesday Challenge ! Please email us at the address in the sidebar of the challenge blog so we can explain how you claim your prize ! Please make sure you include your full name so we can send a gift certificate. Oh this is beautiful, I love the embossed and water colored flowers, thank you for joining us at HLS. This is so pretty! What a classy and elegant card! Thanks so much for joining the HLS CASE challenge. Good luck! Beautiful and original take on Rahmat's card, Kim. Truly lovey. Thanks for playing along at HLS CASE the Designer. Your art is stunning, and it's clear that you are a very talented artist. I've really enjoyed browsing through your blog. I run a challenge blog called Word Art Wednesday, and I'd like to invite you to stop by and share your wonderful cards with us. Our prize this time is $25 from Simon Says Stamp. I'd love to have you play along. I hope you'll join us. This card is so pretty trimmed in gold! Love this! Thanks for joining us in the Poppystamps Challenge ! Beautiful gold and watercolor! So elegant!